I’ve decided that when Taylor Swift first sang the words ‘I knew you were trouble when you walked in’ she was talking about one of two things: 1D’s Harry Styles or the perils of social media. Social media is a bear trap for brands and the latest honey to lure them in is the World Cup. Put simply, if a tweet misses the net the person behind the shot will end up paying the price. 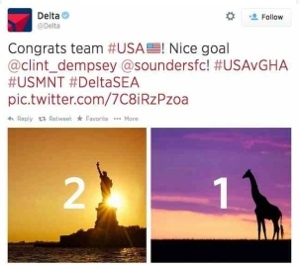 On Monday night Delta Airlines decided to keep its 690,000+ followers updated on the final score of the USA (2) vs Ghana (1) match with this tweet. On the outside this looks like a great tweet. It’s factual, engaging and makes the most of iconic photography. Look a little closer and you’ll see that it was all going so well until the company decided that the photo that best defined Ghana was a giraffe. In fact, with a bit of digging the experts discovered that this stock image had Kenya written all over it. (Well, you know what I mean.) So, there’s no reason, or excuse, for the Delta team to have got this one wrong. Not only does it make the brand look a little unworldly – believe me for a travel company that’s not the adjective you want to be associated with – but also a little uncaring. To right its wrong, Delta did the only thing it could do in this situation: issue a public apology. But, I can only imagine that its community manager was trembling with fear because it added an unnecessary step to its sorry note. It made a typo by referring to its ‘precious’ tweet (opposed to previous). I’ve previously said that if a link between a brand and an event isn’t obvious then they shouldn’t be wading into the conversation at all. Global events, like the World Cup, are not only notoriously difficult to generate cut-through, but when brands do get noticed it’s often because a mistake’s been made. Not that you’d ever know Delta had been issued a yellow card. The offending image has disappeared from the timeline and the airline has spent the last day ‘doing a Sainsbury’s‘ by directly apologising to its critics. Perhaps I’m not giving Delta enough credit. It may have been completely in control of this risky stunt. But, it’s not one that I’d ever recommend.